The Kool King MWK-08CRN1-BJ8 8,000 BTU air conditioner will cool an area up to 350 square feet. Window installation kit is included for vertical opening windows. 3 cool and 3 fan speeds. 4-way air direction helps to cool the room faster. Sleep Mode adjusts the room temperature for more comfortable for sleep, then gradually increases room temperature after being activated. Auto Restart restarts with previous function setting automatically when the power resumes. 24 Hour Timer On/Off. Energy Efficiency Ratio: 10.8, Energy Star compliant. Eco-friendly refrigerant R410A. Digital LED display with soft touch electric control panel. Convenient temperature readout displays the set temperature. Easy wash filter makes it simple to keep the air clean and cool. Features a "Check Filter Reminder", reminding you to clean filter after running 250 hours. The Remote Control allows you to precisely control the operation mode easily. Easy to install and operate. 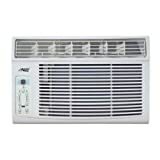 Kool King MWK-08CRN1-BJ8 Window Air Conditioner with Remote, 8000 BTU out of 5 based on ratings.